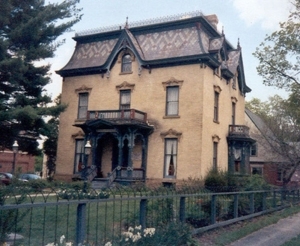 The Albion Historical Society works to preserve and display the heritage of the Albion area as well as to operate the Gardner House Museum. Founded in 1955, the society is a non-profit organization run by a volunteer board. There are no paid employees. 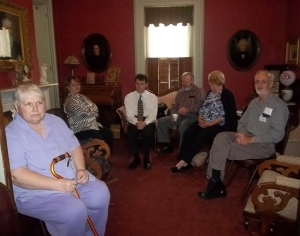 Members gather in the south parlor of the museum. Do you love history? Do you want to support the Albion Historical Society? Join today! New members are always welcome. The Society needs volunteers to give tours of the Museum, plan events, archive artifacts and much more. The Society publishes four newsletters per year. To stay up-to-date on Gardner House Museum news and Albion Historical Society happenings, visit our Newsletter page to download one of the recent Society newsletters. Do you know that Albion has ties to the Purple Gang of Detroit? To learn more, read the Albion Downtown Development Authority's brochure which includes a map for the historic Walking Tour. Read about Albion's other claims to fame and more. The Albion Historical Society transferred its photograph archives to the Albion District Library's Local History Room in 1997. The collection includes many rare late 19th and early 20th century photographs of local families, businesses and organizations. Be sure to visit the Local History Room website to learn more about the collection of materials archived there. It is open Wednesday 2-4 p.m., Thursdays 1-7:45 p.m., and Saturday 1-4:45 p.m. The historic Bohm Theatre first opened in 1929 but closed in 2008. Now the Friends of the Bohm Theatre have made huge leaps to transform it into a performing arts facility. The City of Albion lists some important dates in the area's history. Albion sits on the eastern part of Calhoun County. Visiting from out-of-town or looking for something fun to do? The Battle Creek/Calhoun County Convention & Visitors Bureau provides ideas as well as history of the area. Or visit the Albion section of Pure Michigan. Interested in your family's Albion history? Investigate within the Calhoun County Geneaology Society. Or visit the Find A Grave website; every grave in Albion's Riverside cemetery is listed there. Learn about other historical areas in Michigan. The Albion Historical Society is a member of the Greater Albion Chamber of Commerce and the Historical Society of Michigan.